Adam Gemili has said he faces a tough challenge to make Britain's squad for this year's World Championships because of the quality of sprinting. The European 200m champion, 21, is among a crop being called the golden generation of sprinting. "Sprinting is at another level right now," he told BBC Sport. "I've got to make the British team first before thinking of the World Championships but once I do that I'll aim for a medal, aim for the top." In recent years Britain's sprinters have not been ready to challenge the best in the world, but two - James Dasaolu and Chijindu Ujah - have run under 10 seconds in the 100m. Last summer, the British men won European 100m and 200m gold for the first time since 1998. 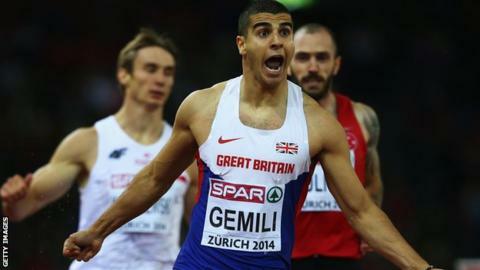 Gemili, who only committed to athletics late in 2011, won his first major title last summer, securing European 200m gold in Zurich, and also took 100m silver at the Commonwealth Games. The Londoner will hope to continue last year's medal success and a natural consequence of that, he says, will be breaking John Regis' 20-year British 200m record and dipping under the 10-second barrier in the 100m. "Breaking the 10-second barrier in the 100m is definitely an aim. It's not the biggest goal of the year but once you go for medals these times will automatically come," said Gemili, whose build-up to Beijing will include competing in July's Anniversary Games in London.